Home Off Beat	Bacon freak tattoo for those who cant resist it! 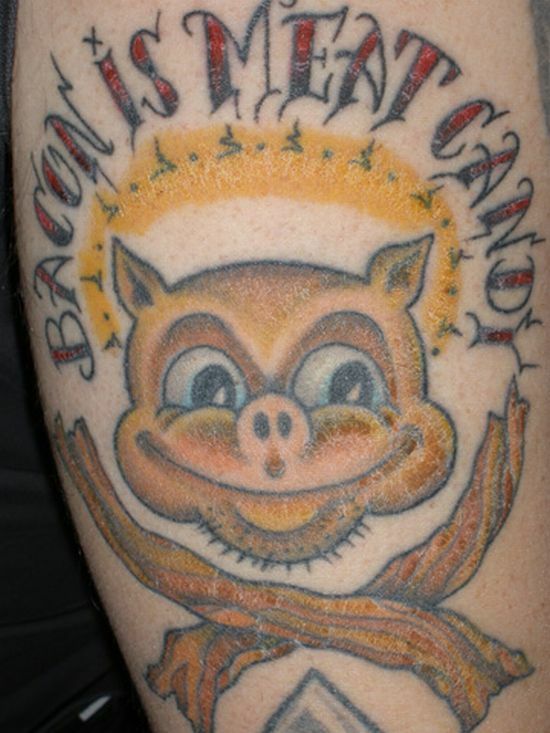 Bacon freak tattoo for those who cant resist it! When a person truly falls in love with bacon, itâs simply not enough to just eat it. You want to adorn yourself with it by surrounding your existence with its smoky flavor. I think, that for this guy simply walking around everyday wearing a stylish bacon t-shirt was not enough to express his dedication for this fabulously flavored flesh. So, he got himself inked with a smiling face of a bacon freak mascot with a pair of bacon slabs crossing each other to create a very unique design. For all the bacon freaks out there ,if you want to announce your love for bacon you donât have to scream it from the highest roof top but check this piece of art. Mario as militant: Ready for the fight! Poetic tattoo to inspire self! ← Spinal tat can leave you awestruck!